This is the second scrapbook page we did for our August Stamp Club meeting. We got to use some of the new stuff! Stamp the circle and square images from Dreams du jour in Pink ink repeatedly on the Cameo Coral paper. Cut a 2 x 9" strip of Pink Pirouette paper, stamp butterfly from Dreams du Jour repeatedly in same color ink. Ink top, bottom, and left hand edges with Cameo Coral ink pad. Use Choc Chip marker to ink just the word "happiness" from the stamp from Heard from the Heart set and stamp on upper portion of the Pink strip. 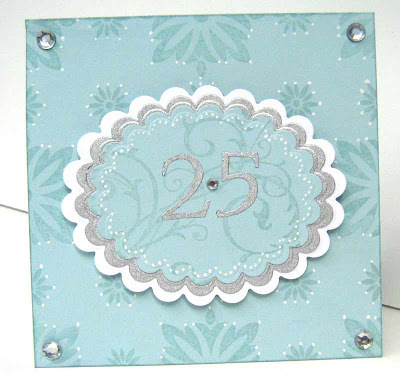 Die cut a scalloped circle and scalloped square from Pink Pirouette. Stamp images in Choc Chip ink. Use blender pen with Cameo Coral and Kiwi Kiss ink to color flowers and leaves. Punch 1 Pink, 2 Kiwi Kiss, and 2 Cameo Coral scallop circles. Stamp butterfly image on each of the them with coordinating ink. Ink edges of all scalloped shapes using Choc Chip marker by gently rubbing wider part of the brush tip in a downward motion over the edges. This allows you to get into all the crevices. 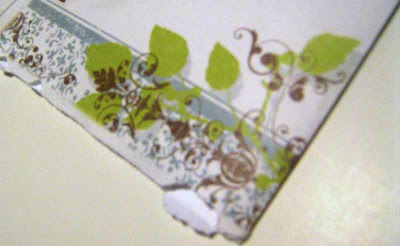 Cut a 4.25 x 5" piece of Kiwi Kiss paper, then use scallop edge punch on one of the long edges. Use SAMJ to stamp the scallops with one of the small scallop images from All Scallops set in Choc Chip ink. Ink edges of scallops and right hand side with Old Olive Marker. Adhere the Pink strip on left hand side of page approximately 1.5" from edges. Adhere Kiwi Kiss piece right against pink strip lining it up with bottom edge. This leaves space for a 5x7" photo. After photo is placed, then Adhere all the scalloped shapes over seam as shown. I found my inspiration from Michelle whose SCS name is mybelle101. Thank you Michelle, yous is beautiful! I put the phrase from the front of here card inside mine. It reads " Life is not measured by the number of breaths we take, but in the moments that take our breath away" Isn't that just beautiful! These are the cupcake cards that we made for Club this month, aren't they fun?! There are so many great examples on splitcoast, I had to try to make these with the girls! First I cut the card bases, 4 x6", then folded in half so fold is at the top and it now measures 4" wide by 3" tall. Traced the cupcake base onto paper and cut out. Or you can measure down 3/4" from top fold on each side and mark wit a pencil, then measure in 3/4" from each side and mark on bottom edge. Then use paper cutter to trim a diagonal cut on each side, then hand cut to create a rounder corner. I know, clear as Mud! Traced "frosting" template onto 3 x 5" piece of Close to Cocoa and cut out. Stamp the Swirl stamp from Baroque Motifs with Chocolate Chip ink a couple times on the "frosting". Use Chocolate Chip marker to ink the edges. Take a 3 x 6" piece of DP and run it through the paper crimper with the narrow edge going through first. Center the crimped DP on the card base, flip over and cut to fit the card base. You can also lightly run the coordinating ink pad over the raised areas to highlight them, and around the edges of the card. 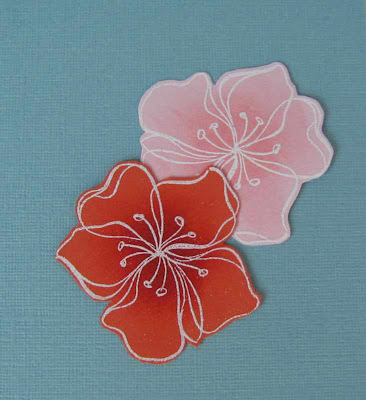 Take the little Cake stamp from One Smart cookie and ink with the Apricot Appeal or Pretty in Pink ink and stamp repeatedly on a scrap of WW CS. 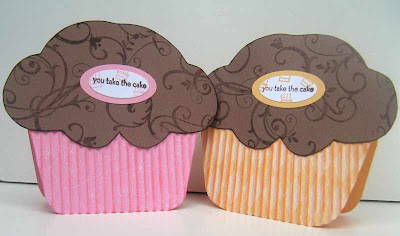 Now Use the "you take the cake" stamp from One Smart Cookie set and stamp over the little cakes in Choc Chip ink. Center phrase in the small oval punch and punch out. Use large oval punch with coordinating CS and punch out the mat. Glue both together, then glue centered on the "frosting". Stamp "Birthday hugs and wishes" inside card. Ok, here is the how-to on the Tropical page for those who are interested. First cut 2 skinny 12" long curvy strips of cCreamy Caramel. Set aside. 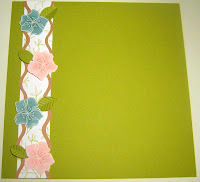 Use embossing buddy on 2 scraps (at least 2 x 4.25") of either Baja Breeze/Pink Pirouette or Tangerine Tango/Pink Pirouette. Then stamp the large flower from Embrace Life twice with Versamark on each of the scraps. Cover with white EP, tap off excess, then heat emboss with heat gun. 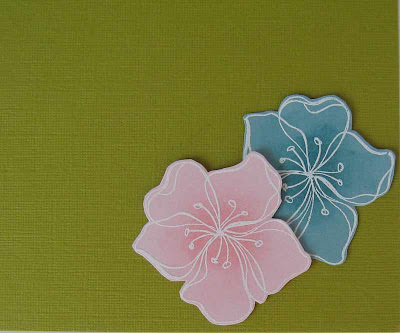 Use sponge daubers to color centers of flowers with coordinating ink as listed above. Cut flowers out with paper snips and set aside. The leaves are made by taking a long scrap of Kiwi Kiss paper, folding it in half, then running it through a paper crimper at an angle. Then while it is still folded, cut out half ovals with pointy ends to make your leaves. You will need 4 leaves and my scraps were about 1.5 x 7" Easy Huh! Here is where I found the tutorial for this trick by Patty Bennet. Now take a 2 x 12" piece of Whiper White and stamp the branch of leaves randomly in Kiwi Kiss. 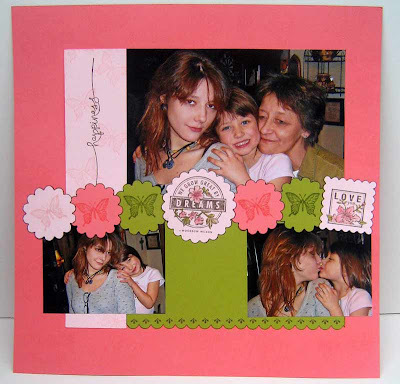 Now you can glue everything down as pictured, and add your own pictures, title, and journaling! ...will be on Friday, September 19th at 7:00pm at the Quilted Loon, I hope! I am waiting for Mary to call me back to confirm. Otherwise, we'll find a place, but the date will stay the same. Deb is the hostess for September, Yeah for Deb! 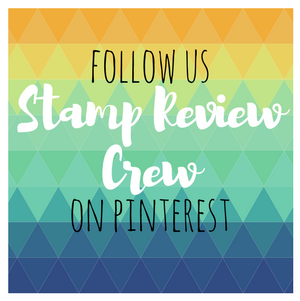 I had hoped to post some pictures of the projects from stamp club today, but drats! My daughter made off with my camera again when I wasn't looking! GRRRR! Teenagers! She does take awesome pictures, but I would like her to at least ask before she takes it. I believe her intentions are good today. She is babysitting for a single mom of 2 darling little boys, and the mom doesn't have the time/money/camera to take pics of her kids. Charlene is taking them to the beach today and I bet getting some great shots of them playing on the beach, in the water, and on the playground equipment. Ok, here I go rambling again! I bet most of you don't even read this, LOL! Happy Stamping until next time! This is the card I made for some friends of ours that got married this weekend. I used the invitation they sent us for inspiration. 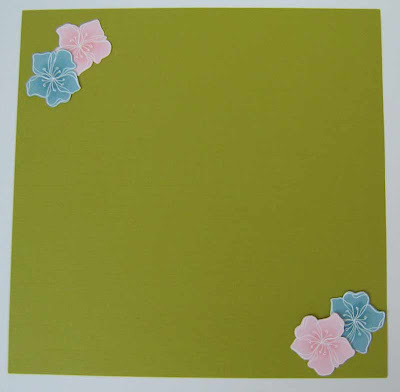 Below is the invitation envelope with the design. I used the new In-Colors for the card, and just zipped right along! Don't you just love it when that happens?! First I masked and sponged the 2 stripes on the edge of the piece of WW paper with Baja Breeze ink. Then I stamped the swirl from Baroque Motifs over the stripes. Then I stamped the butterfly stamp from Dreams du Jour twice with Versamark on vellum and embossed one with white ep and the other with black ep. Then colored them with Pacific Point and a blender pen and a Summer Sun marker. Then used Star Dust Stickles to glitter the butterflies. Ran a piece of Kiwi Kiss paper through the Cuttlebug with the Textile embossing folder, ran the Kiwi Kiss ink pad over the raised areas. Distressed all edges with the distressing tool from the Cutter kit and inked edges with Choc Chip ink. Used Your Day stamp from Celebrate Everything in Kiwi Kiss on WW paper, punched out with small oval punch, then punched a large oval out of Baja Breeze. Adheres layers and ribbon to card, attached matted oval over ribbon with eyelets and the layers with a couple more eyelets. When the butterflies were dry, folded the wings up and glued to card front. 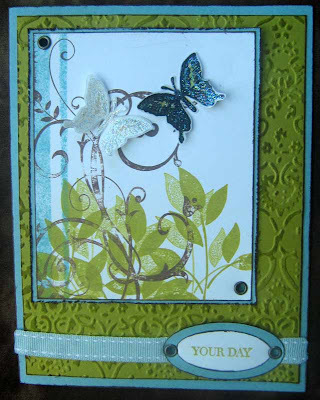 Stamped "wishing you happiness today & always" from Heard from the Heart inside the card. Ok, yet again I cannot stick with simple... I had to do more! So this is the redo of the Kiwi Kiss Tropical page that we will be doing at Club on Wednesday. It looks much better, right?! But it's not a lot more work, so still fairly simple. I learned a new technique for the leaves, dramatic but easy. Still waiting for the inspiration to hit for that last project....it will hit before club, don't worry! 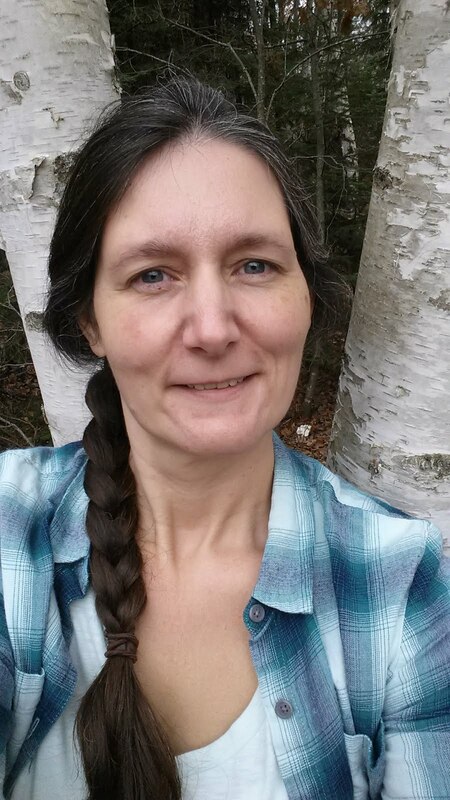 I need to take more pictures, but my kids are never around or willing to have their pictures taken anymore :( What's a mom to do? I have 2 Seniors in high school this year and I need to start working on taking their Senior photos. I will do them myself cuz I can't imagine paying hundreds of dollars for something I can do for under $100 for both of them! Cheapskate, I know. But there are so many other things to spend money on, like stamps! ;) Just kidding! There are other more important things on my "have to have" list. And for those of you who know me, you know what I mean! Ok, now I am just rambling! If anybody has some good ideas for senior pics, please leave a comment! Thanks! Let me know what will work, and I will contact the Quilted Loon for availability. And for any non-Stamp Club members out there that would like to attend, this is open to anyone! I will have more details later.... cost, date, activities, etc! Just send me an email if you think you want to be kept up to date. 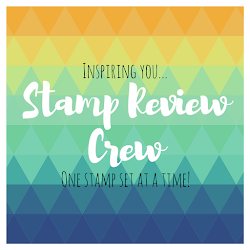 So, we will be having a Stamp Club meeting next week, I'm thinking Wednesday or Thursday, whichever more people can make it to. I'm hoping Wednesday. Two of my coworkers left for Jamaica this morning and I was feeling in a tropical mood, so this is what I came up with for a fun summer scrapbook page for Club this month. I only bought one pack of the new In-Colors textured paper, so I only have 4 sheets of each color. 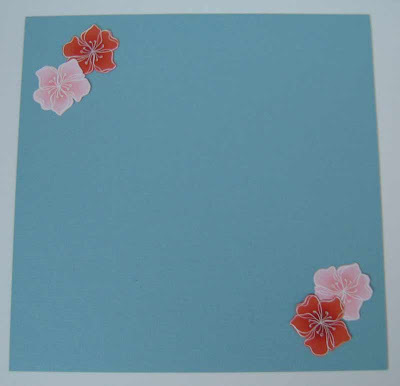 I really wanted to use it this month because I just love the textured paper for scrapbooking. So this month, 4 people get Baja Breeze, and 4 get Kiwi Kiss. And if more than 8 people make it to club, then they will get to use Pink Pirouette! 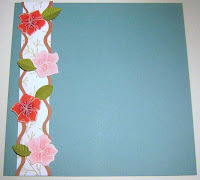 Here is a close-up of the texture on the Baja Breeze cardstock and the Tangerine Tango and Pink Pirouette flowers. They really stand out so nice! 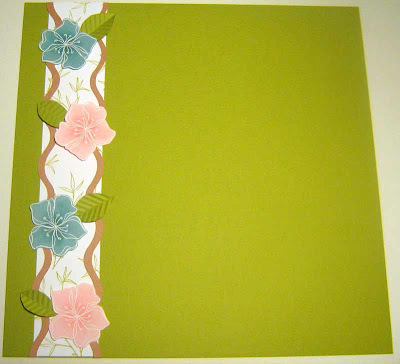 And these are the Pink Pirouette and Baja Breeze flowers on Kiwi Kiss textured cardstock. Just a little teaser to get everyone excited about club this month...and yes, I tried to keep it simple. We'll see how it goes :) I'll try to get wome pictures to display with this layout so it doesn't look so naked...but I can't actually glue anything down cuz then I wouldn't have enough cardstock!